Load setup allows to load a setup file from disk. Save setup saves current setup to disk. Save setup as saves current setup in a specified path to disk. Load project allows to load a project including setup, background image and mosaic data from disk. Save project saves the project to disk. 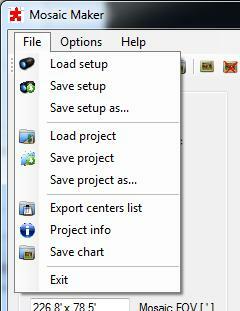 Save project as saves the project in a specified path. Export centers list opens a window with the list of centers. You can copy the list to the clipboard or export it to a text file. Project info gives some info about the current project. Save chart allows you to save the graphic area as image. Exit saves current settings and quit. Load image opens a dialog window where you can choose the background image. Remove image removes the background image. Settings opens a window where you can set if you have a camera rotator, the working directory, apikey and proxy credentials. Grid mode and Free disposition set the way you can place frame centers. the mosaic is a grid whose dimensions are Columns and Rows. 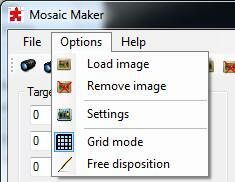 A left click on the graphic area centers the mosaic under mouse position while a right click resets the orientation an moves mosaic center back to image center. The mouse wheel controls the Mosaic orientation, increasing or decreasing by 5 degrees. The combination of mouse wheel and CTRL key sets the step to 1 degree. If the option Use camera rotator is selected, each single frame is rotated to have a rectangular FOV. If the option is not selected, each frame is shown as it will be taken on site. The effect is more visible at high declination, either positive or negative. are disabled and Camera orientation is enabled. Camera orientation, increasing or decreasing by five degrees. 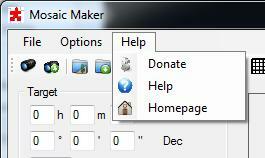 The combination of mouse wheel with CTRL key sets the step to one degree. In Free disposition each frame can have a different orientation. In Free disposition, without background image loaded, dimension of the graphic area can be changed modifying Columns or Rows. Donate if you want to support the project. Homepage opens the author’s web page.